Primus has been my favorite band ever since my seventh-grade-self laid ears on Sailing The Sea Of Cheese in 1991. Their quirky bass guitar-led hybridization of funk and thrash metal (and nearly everything in between) and Les Claypool’s humorous lyrics had me hooked from then on. 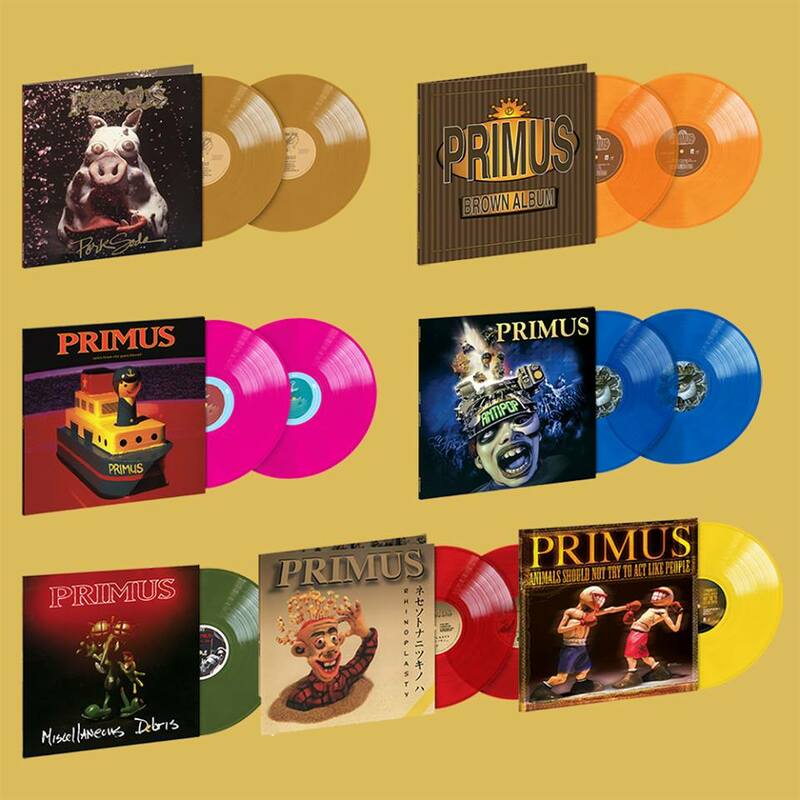 So, I was completely ecstatic to see that Interscope/UMe are releasing the Primus discography on vinyl, each for the first time since their initial pressing. Previously, 1991’s Sailing The Sea of Cheese was remastered and reissued on vinyl in 2013 so out now are newly-remastered vinyl reissues of Pork Soda (1993), Tales From the Punchbowl (1995), Brown Album (1997) and 1999’s Antipop. Also, making their vinyl debut are their two excellent cover EP’s, Miscellaneous Debris (1992) and Rhinoplasty (1998). Rounding out the collection is the 2003 reunion EP, Animals Should Not Try to Act Like People. The albums are available on 180-gram black vinyl as well as limited edition color versions for each release (as seen above) and include a download code on an album cover sticker, featuring the remastered audio in WAV format. Additionally, Rhinoplasty is bolstered by an extra bonus track, the fan favorite cover of “The Devil Went Down To Georgia” and Tales From The Punchbowl is outfitted with new artwork. To celebrate, here are 3 of my favorite Primus songs. Enjoy!